He did not speak during Thursday’s briefing, or at a follow-up event at a northern Virginia community college Friday night. But his presence, and his connections to the organizers, indicate that he may be more than a spectator. Sami Al-Arian arrives for an Egypt Freedom Foundation program in Annandale, Va., Friday night. He attended a similar Capitol Hill briefing Thursday. The two events featured speakers critical of the Egyptian military for removing President Mohamed Morsi from office July 3, after days of massive street protests that reached historic proportions against his year-old rule. Morsi was the Muslim Brotherhood’s candidate in Egypt’s 2012 elections. 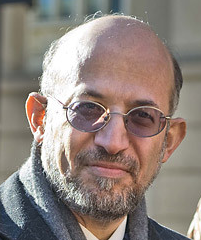 Our predecessor publication last reported on Sami Al-Arian in March 2009 indicating that he was to stand trial on charges of criminal contempt in relation to his failure to testify about the International Institute of Islamic Thought (IIIT), a part of the U.S. Muslim Brotherhood. Our predecessor publication last reported on Muslim American Society (MAS) leader Mahdi Bray in January 2011, at that time said to be recovering from a serious stroke. The GMBDW has featured several reports detailing the Muslim Brotherhood ties of former Obama Faith Advisor Dahlia Mogahed.